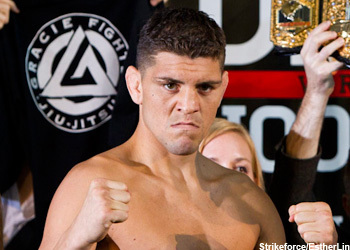 Strikeforce welterweight champ Nick Diaz is regarded as one of MMA’s best Brazilian jiu jitsu practitioners. Although his stand-up game has evolved nicely over the last several years, it was a foregone conclusion he would take KJ Noons to the canvas on Saturday night. Instead, Diaz opted to go toe-to-toe with the former boxer and methodically picked Noons apart. He used his infamous potshots to earn a (48-47, 49-47, 49-46) unanimous decision victory in front of the pro-Diaz audience. The controversial grappler bumped his record to an impressive 23-7 (1 NC) en route to retaining his crown. Although he wasn’t able to post a finish on Saturday night inside the HP Pavilion in San Jose, California, 19 of his wins have come before the final horns have sounded. Although Noons was visibly upset after the unfavorable verdict was rendered, the 27-year-old remained classy in defeat.